Toyota vs. Tesla – can Hydrogen Fuel-Cell Vehicles compete with electric vehicles? The world has been abuzz about the recent Toyota announcement that the company opened up licensing of its 5,680 HFCV patents (although only until 2020.) By taking a page from the Tesla playbook, Toyota is hoping to encourage an ecosystem of fuel cell suppliers and hydrogen fueling stations. Is this the last hurrah of a dead-end technology? Or will it re-invigorate the HFCV market which has gone nowhere for decades? Does the Hydrogen Fuel-Cell Vehicle (HFCV) matter anymore? But Jim Lentz, CEO of Toyota North America says that his company is betting big on hydrogen fuel cell cars. 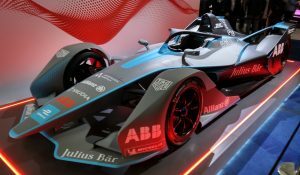 Does the HFCV have a chance against the Electric Vehicle (EV)? I don’t even mention HFCV’s in my book “Clean Disruption of Energy and Transportation”! There are multiple reasons for that. Let’s look at the facts, starting with the basics. Many industry insiders talk about hydrogen as if it were an energy source. For instance, they might compare it with, say, petroleum products like gasoline and diesel, and say that H2 produces no emissions. Hydrogen is not an energy source. It’s an energy carrier. It’s a form of storage. You need primary energy sources like the sun, coal, natural gas, or uranium to generate the power needed to extract Hydrogen from a source material like natural gas or water. Electric vehicles, on the other hand, have a ready infrastructure: the power grid. Everyone who lives and works in advanced economies has access to electricity. 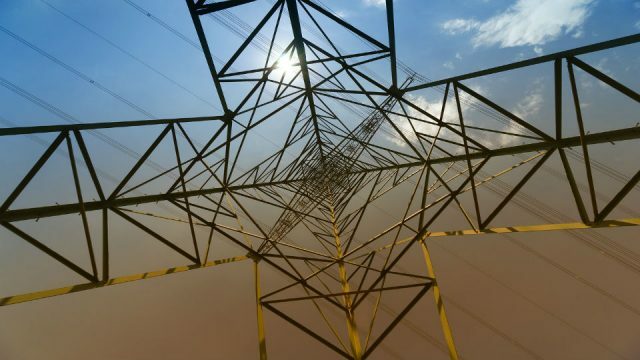 Yes, our grid is aging and we need to upgrade it, but it works today. Some readers may remember that the Internet started with the plain old telephone system. It wasn’t fast but it worked. Then we upgraded it to get the fast pipes that we have today. We also built a brand new wireless infrastructure that required no pipes at all. 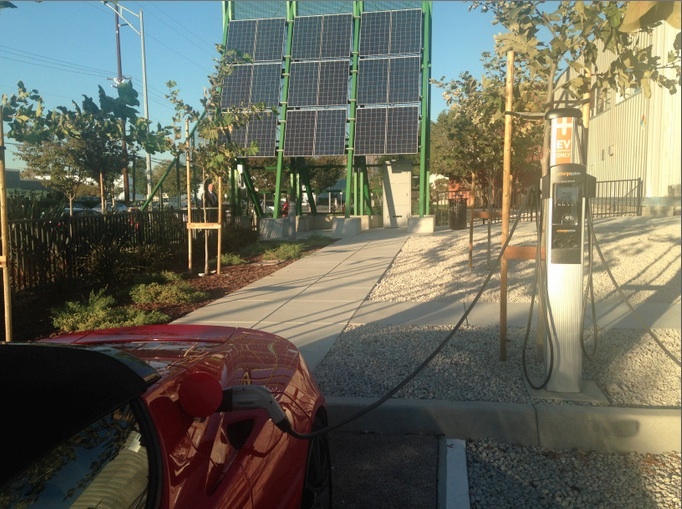 The electric vehicle equivalent of the wireless power infrastructure is distributed solar. The multi-trillion dollar hydrogen infrastructure would have to be built from scratch. About 95% of hydrogen in the US is made from natural gas in large central plants, according to the Department of Energy. It’s a method called natural gas reforming. Methane (the main component of natural gas) is 72 times worse than CO2 as a greenhouse gas (when measured over twenty years). Natural gas leaks throughout the supply chain. It leaks when it is lifted from the ground, when it is stored, and when it is transported in hundreds of thousands of miles of pipelines. According to the U.S. Environmental Protection Agency, three trillion cubic feet of methane leak annually. That figure represents about 3.2 percent of global production. This methane leakage is the global warming equivalent of half the coal plants in the United States. Today, hydrogen is basically a repackaged fossil fuel – a fossil product line extension, if you will. If you like natural gas and fracking you should love hydrogen. 5) Hydrogen is not ‘renewable’! 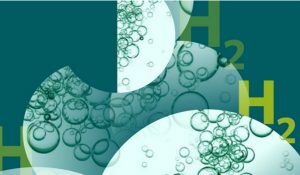 Hydrogen is classified as ‘renewable’ when it’s extracted from water by means of hydrolysis. This method involves applying high voltage electricity to split water into Oxygen and Hydrogen. When you apply conventional electricity to do the hydrolysis you still have to burn coal, natural gas, nuclear, petroleum, and so on, so you still have dirty hydrogen. We need to pause to consider the water-energy-food nexus. Conventional energy is thirsty. In my books Clean Disruption and Solar Trillions I write at length about the obscene amounts of freshwater that coal, natural gas and biofuels consume. By adding Hydrogen to that list we would have yet another way for energy to dry up our planet. A well-to-wheels analysis by University of Texas Professors Carey W. King and Michael E. Weber found that a HFCV would need to withdraw 13 gallons of water per mile driven. The same study concludes that a gasoline car would need withdrawals of needs 0.63 gal H2O/mile and a diesel car would need 0.46 gal H2O/mile. That is, gasoline petroleum-based transportation is 20 to 28 times more water efficient than hydrogen. If we use solar or wind power as the source of the electricity for hydrolysis then you could have ‘clean’ and technically ‘renewable’ Hydrogen. I say ‘technically’ because the world is already pumping water at non-sustainable, non-renewable rates and the massive amounts of water you’d need for hydrogen would just contribute to the world’s water crisis. A 2015 World Economic Forum report ranks water crises as top global risk, up from number three the previous year. Powering EVs using solar and wind would use no water, according to Profs King and Weber. Plus EVs are at least three times more energy efficient than Hydrogen Fuel Cell Vehicles. It makes sense for the fossil fuel industry to lobby for the hydrogen car because hydrogen is essentially a product line extension for them. In other words, the “Hydrogen Economy” is the “Fossil Fuel Economy” with a green sheen. The HFCV is a substitute technology. 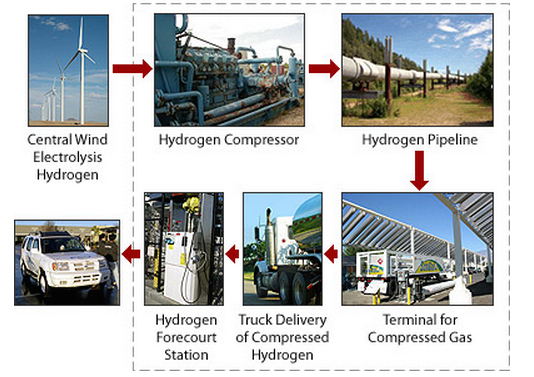 If successful, hydrogen would just substitute the fossil fuel infrastructure with a mirror hydrogen infrastructure. It’s obvious why I don’t even mention HFCV in my book “Clean Disruption of Energy and Transportation”! Hydrogen Fuel Cell Vehicles are neither clean nor disruptive. At best, a hydrogen economy would still be a massively wasteful economy that would at best use three to six times more energy than an electric vehicle and solar/wind infrastructure and many times more water than even gasoline uses. There are many good reasons why hydrogen fuel-cell vehicles are stuck in reverse while electric vehicles are on hyper-drive. It’s time to move on from hydrogen fuel cell vehicles. This article in my view falls into the category of TINA (there is no alternative) and you could also say the writer (like the inhabitants of DG Clima & their ETS nirvana) is a mono-maniac – blinded by the tech. I do not disagree with some of the points – the cost of an H2 infrastructure etc. And yes, EVs have a role to play certainly in removing diesels and their PM2.5s & 10s and NOx from cities. In the case of the statement: in 2030 100% of cars will be EVs, I’ll put this down to American (west coast?) optimism. 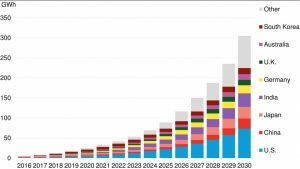 In 2030 we will have a blend of transport solutions including EVs, possibly fuel-cell vehicles (buses) for cities, and CNG-powered vehicles using, for the most part, synthetic natural gas produced using renewables electricity. Of course this may not happen. But, it would be a more realistic route than the EV-nirvana put forward (which always omits the – how long do the battery packs last and how much will the cost to replace). I’m not going to say any more because there will be an article on this subject (power to gas) by me, next week. As for infrastructure, I’ll follow your P2G vision with great interest. The future will be synthetic hydrocarbons. Nothing beats the refuelling speed. 3 minutes refuelling gives you 800 km. No leaky explosive hydrogen infrastructure can beat the safety aspects. Battery cars are nice for yuppies, not for truckers. Especially since there will be no need for an expensive and dangerous hydrogen transport network (neither cars nor long pipelines). Hydrogen will be produced by unmanned P2G plants housed in a standard sea-container (or a few) at the car refuel station. Of course also some local storage, so the remote (computer) controlled plant operates mainly when the whole sale price of electricity is very low (= wind & sun). Check the developments in Germany. So a power line to the car refuel station is enough, which line is then already installed for Battery Electric Vehicles. hydrogen is not dangerous or as explosive as other fuels. also infrastructure is not a problem since you can attach a self functioning electrolysis/pump to any solar powered building and refuel for free at home. then the loss of energy is a non issue because it is just solar energy. less deteriorating batteries and easier to store energy. Seems you didnt have experience of hydrogen blasting by chemistry teacher in your 14. Also please read smth. about Gindenburg airship in 1937 (aka Indiana Joneas and the last crusade…). It might help you to rethink about safety and hydrogen issues. You mean the Hindenburg,presumably, and it has been shown that it was the metallised cloth which was burning and caused the damage, The released hydrogen escaped vertically upwards burning above and away from the airship. Hydrogen is only explosive, as with other flammable gases when mixed with air. However when you come to lithium batteries, just ask Samsung what happened to their phones. Hot stuff or what? If you look on how an electric vehicle is made, you can argue that it has nothing in common with conventional cars. Look at this post from Tesla where they explained why they soon realized they could not use any parts from Lotus. Electric cars are datacenters on wheel, all the solutions invented by the conventional car industry have no problems to solve in a full electric car (engine, exhausts, bad balance, gas tanks…). 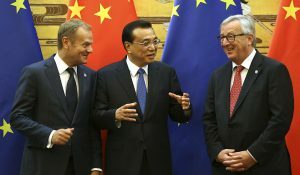 Whereas they have no talents who know how to manage the 12V bus and are not as efficient to manage a supply chain of electronic equipments than electronic manufacturers. And I am not even talking about software and batteries. If you really look at what matters in order to build an electric car, companies like Apple have already much more knowledge and much more efficient while the gap the conventionnal car manufacturers have to face is simply huge. Hydrogen cars and P2Gas cars seems more fit to the industry. So the argument “we should not build a RE-gas infrastucture because we have a powergrid” is not really a good one. Regarding Hans comments on trucks… I do think on the contrary that long distance trucks will be the easiest to electrify because you can just electrify motorways with cables (see Siemens concept). This would be actually a technical fix to all these trucks who are filling their tank in places where the fuel taxes are the cheapest in Europe while destroying another countries roads not paying their fair share in the process. Electrical roads for trucks already exist, they are called railroads. The nice thing about conventional roads is that they go directly to the destination. Where do you deliver where there is sparse population? What is your solution for Africa? Synthetic fuel has all the benefits of CO2 neutral emissions, and the ease of use of distribution, speed of refueling and energy density. Agree with you. However, ethanol/methanol fuel cell seems interesting, esp. in cold areas, isn’t it? This text is just EV propaganda and has nothing to do with correct comparison. Green electricity production is highly variable and needs storage solution. EV cars do not work as energy storage because it is extremely difficult to change behavior of people and smart grid is not implemented yet. 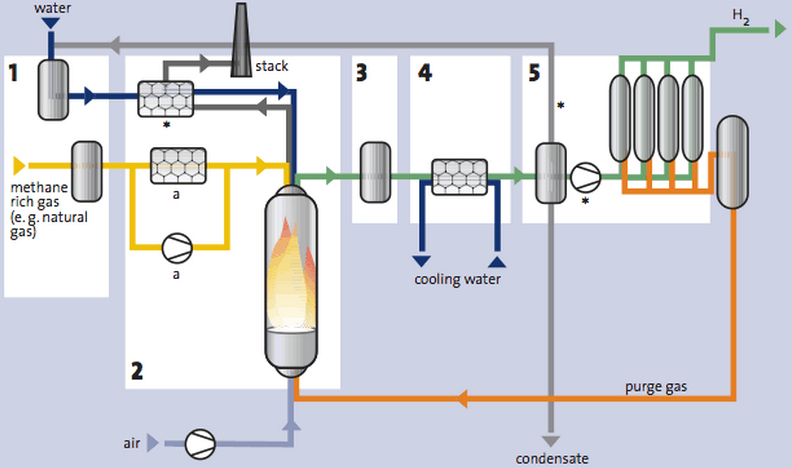 H2 could serve as energy storage which is compensating lower efficiency. The most important for future is not technical efficiency presented in this text but overall market efficiency. Price of ee for charging EV cars is different than price of ee for H2 production. This economic impact can easily make HFCV cars competitive. I agree with Jan there is a bias in the article here. However to say the smart grid isn’t built yet isn’t a valid argument against it, since the H2 energy storage doesn’t exist either. I believe FCEV’s will exist side by side with EV’s serving needs where EV’s fall short. FCEV’s will be more expensive to run, but if that’s the only viable alternative for specific applications, cost will be discarded as a barrier. The car industry is currently globalised and eminently standardised: the same two or three types of fuel (gasoline, diesel, gas) power all road vehicles anywhere in the world. Companies and consumers love this simplicity, and will want it replicated in future propulsion systems. The attempt to create an interface between power and mobility (power2gas, etc.) currently tends to rely heavily on regional/local circumstances. The cost of building a hydrogen infrastructure will also be very different from one region to another. This might be the single strongest factor in favour of EVs, which will rely at least initially on the existing electricity grids (standardised voltages, standardised costs). Gasoline and Diesel isn’t as standardized as it may appear. Gasoline blends in California tend to be more expensive to meet their requirements. Gasoline has three grades in the US, this differs elsewhere in the world. Diesel differs in composition around the globe to meet local regulations for allowable emissions and particulates. The availability of E85 in the US is spotty and ethanol free gas is available in some markets not others. Locally it does tend to be standardized, and so will be EV charging or Hydrogen. The biggest barrier to standardizing EV charging is payment systems. Why EV stations can’t accept a credit card as payment is brain numbingly frustrating. At least paying for gas/diesel is pretty standard. well this is not about the brand Toyota or Tesla rather than i would prefer to talk about the energy sources, As per research there are a lot of different energy sources are found but as the emission is high on gasoline we must focus on electric or hydrogen power that will reduce the percentage of emission as well as delivers a good mileage. I’ve driven electric locomotives (underground). Fantastic even with old battery technology. Recharging units can be built easily into car parks, residential garages and even parking meters. The local authority will have two sources of revenue. There are already difficulties obtaining hydrocarbon fuels in rural areas. Sunlight, wind power and electricity grids are already well and increasingly established. Car battery packs are being designed by Tesla for house hold storage using solar and wind. The hostility toward EVs is fuelled by working class resentment of technology being driven by college educated kids and anti science sentiment. Should I say that lithium is suitable for smart phones not for cars))). In Nissan Leaf the amount of lithium is more than 40 pounds. We heard about every gadget in Tesla’s Model 3, but how much is the lithium in it, where they are going to get it, how long the battery lasts is still a mystery. And battery is the key factor for that technology. The world’s lithium production for 2014 is about 40 000 MT. 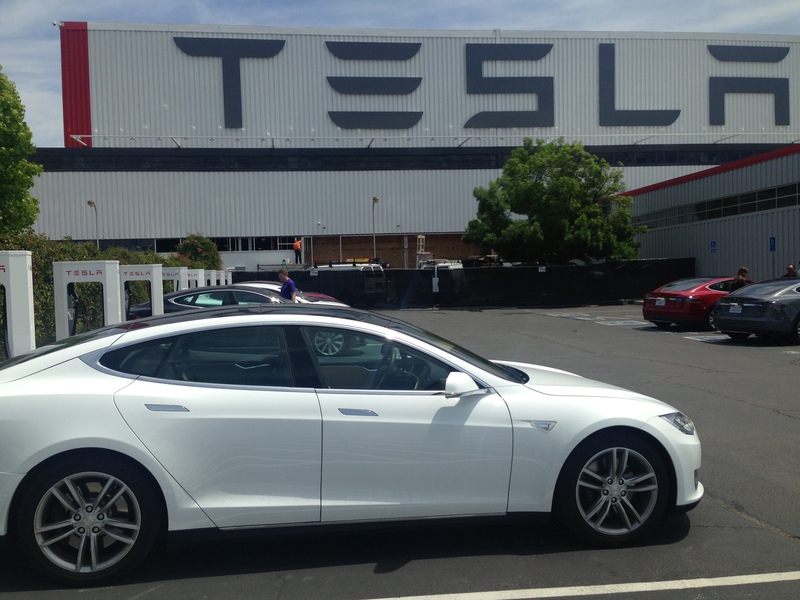 Tesla plans to produce 500 000 cars of the Model 3 by 2020 – even if they use twice less lithium than Nissan this still makes 5 000 MT for this vehicle only. And the price of lithium already jumped up with 30% . For me the main concern about the hydrogen technology is the use of water. But thinking twice isn’t it water that comes out of the car tailpipe? An ICE vehicle with a relatively new catalytic converter will literally drip water when the engine is revved. However most states/provinces in North America do not require them, and many external factors like O2 partial pressure, air temperature, air quality (concentration of dust, water vapor, and things like CO and NOx compounds), and torque load on the drivetrain can affect the efficiency and emissions quality of any hydrocarbon-burning engine. I don’t see why the use of water is such a big deal. A fuel cell stores energy through electrolysis, and releases it through hydrolysis. The start and end product is water. An ICE consumes hydrocarbons and O2, and produces water, Carbon Monoxide and Dioxide, and some NOx. In the end in both cases water is released into the atmosphere, so it’s hard to call that a waste. As for the lithium batteries, battery lifetime depends a lot on usage patterns, and Tesla’s new plant in Nevada will recycle retired train cars AND used Tesla batteries to make new batteries. No expensive delivery infrastructure (similar as for ff) needed. The many unmanned P2G plant developments in Germany (housed in few containers) show that gas stations need a power line which feeds their own P2G plant. Produced renewable hydrogen is locally stored and sold to the consumers. This also implies near zero transport losses, increasing efficiency (electricity+water)=>Hydrogen=>(electricity+water) towards >30. Further efficiency improvement are in development. With the low electricity prices when wind+solar produce >100% of normal consumption needs (in Denmark during >100days/a in 2020), no need to produce hydrogen from natural gas. Same low electricity prices also imply that the hydrogen fuel costs are a small % of the total car costs. they will conquer important market share. Yes, one thing I didn’t like about the article was how it claimed that this would contribute to a water crisis. For brief time periods that might be the case but as soon as the hydrogen recombined with oxygen the water is again created. I think the author was making a fallacy and is almost seems to go against the law of conservation. However, I can see on a global scale how this would contribute still to a new form of climate change since water itself is a greenhouse effect molecule, not to mention the potential rainforest-like swings in weather patterns. Another good thing about Hydrogen is that it can be made at home through green methods. Solar and wind-powered electrolysis and store the hydrogen in tanks that you can use to fuel your car at home or power your house during times when you aren’t able to produce much from the wind or solar. There could be some challenges but as along as water vapor is continuously raining down and not floating in the upper atmosphere it would be okay. Also, I read a paper that said there was only enough lithium in the world for 2.4 bn cars, that’s not including houses or facilities. It wouldn’t be a fix for solving the world’s energy problem. The best method seems to be using a combination of hydro, wind, and solar energy. Not lithium, it’s not something that is massively usable and can be circulated through the ecosystem. It’s direct sun to electric. Hydro is sun/wind -> -e + water -> hydrogen +oxygen -> hydrogen storage -> hydrogen fuel cell + oxygen -> h2o + electricity. It doesnt require massive strip mining of the environment since there are already a lot of gas capsule tanks that can be converted or reinforced for hydrogen. However, even hydros need a battery to an extent, but it doesn’t need to be in the form of lithium. Thank you for this post. I also got confused when he started to go on about the water crisis. He claims that hydrogen production would be dirty. Well that is as much as electricity can be dirty. We don’t produce enough electricity through green energy yet. There is still plenty of coal- or nuclear-derived electricity in use/need. Then there is the problem that electric cars have a huge environmental impact. They use a lot of energy to built and the batteries are not immortal, far from it. What are we going to do with all that waste in -say- 20 or 30 years? The author has a clear agenda, and his CV shows it (see John Meireles’s comment lower). 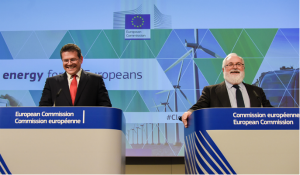 To solve the complex problem of transferring all systems in place to 100% renewable energy, we will have to put aside lobbyism and really weight the advantages and disadvantages from all technologies and use them for the appropriate target. There is no need of a one-sided control of all market by one technology. Let’s work together for the greater good and leave everyone get their shares of the steak! We have to agree that electricity and Hydrogen going to be energy carrier for future. we need to look at the future scenarios, short term, mid-term and long term. In mid-term, use of fossil fuel is dominant and mid-term there will be mixed one where in fossil and renewable energy mix will be playing role and long term totally renewable will be option. Looking at the energetics and efficiencies of Battery Electric vehicle are more efficient. Electricity can be used as energy carrier in three ways. Use directly as electricity using trolley buses and electrified railways, use of battery for energy storage and using on-board as power source and use surplus electrical energy for generation of hydrogen and use as fuel cell. Hydrogen generated can also be stored for long as metal hydride and chemical hydride and countries blessed with plentiful of renewable energy can export hydrogen in various other stable forms like chemical hydride to energy deficient countries. Considering the Practical implementation point of view, range, durability of charge and charging time, Battery option still not considered as very good option. Fuel cell is also neither better than batteries and it has durability issues and also uses rare earth Platinum catalyst. There are many issues has to be overcome. If we target range of less than 150 km, battery electric vehicle is preferred. If we consider anything more than 200km range, fuel cell /battery hybrid is choice. Both battery driven and Fuel Cell/battery hybrid driven required huge captive intensive equipment installation. Only technology reliability, cost, and availability of technology will decide the future. This article seems to me very one sided in favour of EV. 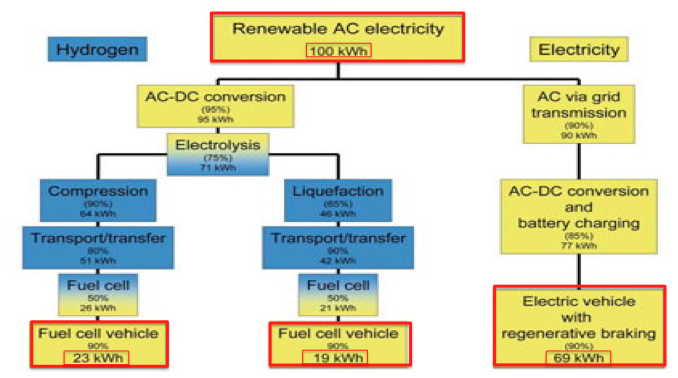 On the spot production of clean hydrogen through electrolysis from RES is clearly a good alternative to EV and HFCV have a much larger range of autonomy than EV and can be refueled much faster. My guess is that both technologies will co-exist for a while in the future. When I started reading the post, my first thought was: this guy must be an MBA, only they can manage to get so many things wrong…That was no surprise…What’s unbelievable, is that he’s apparently taken seriously by such a renowned University as Standford. And it only got worse with lectures posted on Youtube: I heard my share of nonsense and misrepresentation from MBAs in may life, but this one really takes the cake…I mean, to compere average real life efficiency of an ICE powered car with utterly unrealistic (up to 99%???) theoretical peak efficiency of an electric motor and sell it as a realistic on-board efficiency of an EV, one must either be ignorant, delusional, or purposely deceiving…If we calculate theoretical power demand (air and rolling resistance) and compare them to let’s say EPA ratings, we’ll see EV’s on-board efficiency is closer to 60% or not even that. It strongly depends on driving style. Calculating in losses in charger and transmission, hardly 50% of electricity generated gets converted into traction. There’s namely a pesky little thing called electrical resistance. Faster we charge and harder we drive, higher the losses (increasing with quadratic function of the current), particularly in electrochemical cells (batteries). And he obviously doesn’t know much about thermodynamics either. Not to mention various thermodynamical cycles, let alone distinguish Carnot, Ideal cycle and Realistic cycle efficiency (of course we must first decide, which cycles we take and compare, but that was obviously beyond him)…And yeah, there can be done A LOT about improving ICE efficiency. Of course we must first decide about WHICH one…Otto, Diesel, perhaps we should even consider dropping piston engines all together and go with the gas turbine…what about combined cycle…by the way, peak efficiency of best automotive diesel engines is already achieving 45%…We could go on, how to improve efficiency of already existing (piston)engines or to design entirely new ones, about different (hybrid) energy recuperation systems, etc…. And about ridiculous over-hyping of existing solar-PV, I don’t even want to go into it.. The only thing he got somewhat right is that HFCVs most probably don’t have a future, and that solar CAN be the future (but in very different form from current inefficient PV). Very biased article. Lithium based battery technology is a lot more dangerous than using hydrogen. Several Teslas have self ignited, The lithium battery problem on the Dreamliners was ‘solved’ by housing it in a sealed box with an externally vented chimney! and Samsung has had to recall their latest smartphone due to battery batteries exploding and/or self igniting. The Mirai HFCV which went on sale in the USA is selling as fast as Toyota can make them – even with a huge price ticket – and they are intent on introducing a significantly cheaper model in 2019. The claimed cost of a hydrogen infrastructure is a red herring. Were every vehicle to run on mains power, you also need to quickly rebuild the electricity grid, and build hundreds of additional power stations to supply the energy needed. I believe battery powered cars are a failure, and will be seen as a crazy diversion in the near to medium future, when hydrogen powered cars will predominate. There is like a hundred Mirai and most of them are rented on a yearly basis, combined with the incentive and the 15,000 $ of hydrogen Toyota is offering as a gift with the car that means people are literally paid to drive in Mirai… Yet the demand is still not catching up. Surely, when domestic Solar becomes so popular that we start to enjoy surplus electrical energy (I know, very utopian! ), charging our vehicles be it via ‘swap out’ batteries will become Cost Free, enticing consumers to invest in both technologies… the Tesla business model?! But yes this isn’t a practical solution for long haul trucking. But as previously mention the Railway infrastructure exists in most countries to cater for this. I think it was Margret Thatcher that scrapped the British rail freight service … Rail has had such a bad press over the past decade, but it truly is a better solution for long distance distribution and travel… just don’t forget to book your A.I driven Uber Taxi when you arrive at your station! Why would he advocate for alternatives to solar when he sits in the board of so many solar energy focused companies? This article is in favor of EVs… and that’s ok. The important thing is to replace traditional cars (petrol and diesel fuel) with something more ecological. Gas emissions produced by traditional cars are poisoning the air that we breathe: in big cities the situation is critical. We need to change, and electric cars might be a solution. A few points. 1 The argument of the energy source to split water as 95 percent gas based is almost similar to producing energy itself. The electricity-producing network infrastructure seems to be a problem in both scenarios, and lithium battery operated vehicles just as much are only clean if the energy is sourced from renewable sources. In other words, if the energy for hydrogen creation is clean so is the hydrogen it produces. Most developed countries are moving to increase its renewable energy sources. 2. Lithium batteries can not be recycled fully. They will clean our air and toxify the soil and water. Dust from leftover waste can potentially also make it later into the air. 3. The biggest risk with hydrogen appears to be the safety of it, and its safe storage. Some articles I saw speak of large-scale operations, even pipelines and massive storages of hydrogen. In a volatile world suffering from terror and sabotage, hydrogen may bring other challenges that conventional batteries don’t. The emphasis should either be on making batteries 100 percent recyclable or making hydrogen storage extremely safe. That said it is true that hydrogen yields less and is more energy costly in production for now,. This article excludes completely the environmental cost of producing electric cars. One could drive a BMW SUV for 100.000 km to get close to the environmental cost of a Tesla. What are we going to do with all the dead batteries? Are we going to “bury” them underground like we are doing (or are supposed to) for the waste generated by nuclear power plants? Then there is the problem of being able to produce enough power for all these electric cars. Or where will we stock all that energy? I don’t see why the fact that infrastructure would need to be built for the H2 system is now brought as a problem. Are we expecting that the power plants in place for producing electricity will generate enough power for all cars? No. So that means that we will have to built more infrastructures for the E cars as well. I guess it will only depend in who’s pockets the money flows. This is all a game for lobbyists. Like for everything else, lobbyists will make the decisions at the end, no matter whether it is for the greater worst. As long as some get plenty rich. Don’t get me wrong. I would love to believe that electric cars will replace the combustion-based cars. But right now, it doesn’t seem to be viable.